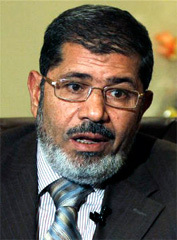 Mohamed Morsi - Who is Mohamed Morsi? Mohamed Morsy is the President of the Muslim Brotherhood’s political party, and after Shater’s exclusion he has become the Brotherhood’s candidate in the Presidential race. However, cracks have started to appear within the Islamist organisation. It’s complete reversal of position regarding the fielding of a presidential candidate has raised a lot of criticism among both Brotherhood members and leadership. According to one source, up to 80% of Brotherhood MPs were against the nomination of a Brotherhood candidate, with at least one prominent MP publicly announcing his opposition to it. Several youth members have also voiced their unease with a Brotherhood-nominated candidate.